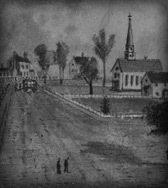 Captain J Q Marr, Warrenton Rifles, was killed during the skirmish at Fairfax Courthouse, Fairfax County, Virginia, between 3 and 4 AM on 1 June, 1861, and First Lieutenant B H Shackleford, Warrenton Rifles, was appointed captain, Warrenton Rifles, on 3 June, 1861. The company was assigned to the 17th Virginia Infantry, Company K, on 10 June, 1861 (See the 17th Virginia Infantry). The company was stationed at Davis' Ford, on Cedar Run, on 21 July, 1861 (See Scott's Squadron Cavalry). The company was stationed at Union Mills Ford, on the Bull Run River, under the command of Jennifer's Battalion Cavalry, under the command of Lieutenant Colonel W H Jenifer, Provisional Army of Virginia, on 21 July, 1861 (See Jenifer's Battalion Cavalry). Second Lieutenant D S Gordon, 2nd United States Dragoons, was temporarily assigned to the 2nd United States Cavalry, Company B, on 1 June, 1861 (See the United States Battalion Cavalry). Lieutenant Colonel R S Ewell, cavalry, Provisional Army of Virginia, was assigned to command the cavalry of the Army of the Potomac and was ordered to Farifax Courthouse, Fairfax County, Virginia, on 28 May, 1861. Manassas Junction, Prince William County, to Farifax Courthouse, Fairfax County, Virginia, Prince William Cavalry & Warrenton Rifles, 27 & 31 May, 1861: The Prince William Cavalry arrived at Farifax Courthouse, Fairfax County, Virginia, in the evening on 27 May, 1861, and the Warrenton Rifles on 31 May, 1861. Note: The Rappahannock Cavalry was stationed at Farifax Courthouse, Fairfax County, Virginia, on 20 May, 1861, and Ex-governor W Smith arrived at Fairfax Courthouse, Fairfax County, Virginia, at 5 PM on 31 May, 1861. Ex-governor W Smith was temporarily assigned to command the Warrenton Rifles at Farifax Courthouse, Fairfax County, Virginia, in the morning on 1 June, 1861 (See the 49th Virginia Infantry). Note: Captain J Q Marr, Warenton Rifles, was killed during the skirmish at Fairfax Courthouse, Fairfax County, Virginia, in the morning on 1 June, 1861. The 2nd United States Cavalry, Company B, was stationed at Camp Union, south of Ross' House, on Arlington Heights, Alexandria County, Virginia, on 31 May, 1861. South of Ross' House, on Arlington Heights, Alexandria County, to Fairfax Courthouse, Fairfax County, Virginia, 2nd United States Cavalry, Company B, 31 May-1 June, 1861: The 2nd United States Cavalry (50/75), Company B, under the commmand of First Lieutenant C H Tompkins, was ordered on a scouting expedition to Fairfax Courthouse, Fairfax County, Virginia, at 10.30 PM on 31 May, 1861, and was accompanied by Second Lieutenant D S Gordon, 2nd United States Dragoons, Company E, and Assistant Quartermaster W Cary, Quartermaster H S Fearing, and Adjutant P Frank, 5th New York States Militia (See the Three Months' Volunteers, Department of Washington). Company B was engaged in a skirmish at Fairfax Courthouse, Fairfax County, Virginia, at 3 AM on 1 June, 1861. Note: First Lieutenant C H Tompkins, 2nd United States Cavalry, Company B, was severely wounded during the skirmish at Fairfax Courthouse, Fairfax County, Virginia, at 3 AM on 1 June, 1861. The Goochland Light Dragoons and the Hanover Light Dragoons were stationed at Fairfax Station, Fairfax County, Virginia, on 31 May, 1861. Fairfax Station to Fairfax Courthouse, Fairfax County, Virginia, Goochland Light Dragoons & Hanover Light Dragoons, 1 June, 1861: The Goochland Light Dragoons and the Hanover Light Dragoons arrived at Fairfax Courthouse, Fairfax County, Virginia, at 6 AM on 1 June, 1861. Centreville to Fairfax Courthouse, Fairfax County, Virginia, 1st South Carolina Infantry, Company E, 1 June, 1861: The 1st South Carolina Infantry was stationed at Camp Gregg, Centreville, Fairfax County, Virginia, on 31 May, 1861, and the 1st South Carolina Infantry, Company E, was ordered to Fairfax Courthouse, Fairfax County, Virginia, on 1 June, 1861 (See the 1st South Carolina Infantry). Manassas Junction, Prince William County, to Fairfax Courthouse, Fairfax County, Virginia, 1st Virginia Infantry, Companies B, D, G, & K, 1-2 June, 1861: The 1st Virginia Infantry, Companies B, D, G, and K, under the command of Major W Munford, were ordered to Fairfax Courthouse, Fairfax County, Virginia, at 11 PM on 1 June, 1861, and arrived via Fairfax Station and W Farr's Crossroad's, one and a quarter miles south of Fairfax Courthouse, Fairfax County, Virginia, at 1 AM on 2 June, 1861 (See the 1st Virginia Infantry).